Spring ball is in full swing and all eyes appear locked on new offensive coordinator Graham Harrell’s simplified ‘air-raid’ offensive scheme. On the offensive side of the ball, the Men of Troy will experience some turnover, as this year’s team bids farewell to multiple, key veteran starters such as tailback Aca’Cedric Ware, tight end Tyler Petite, right tackle Chuma Edoga, left guard Chris Brown, and center Toa Lobendahn, among others. But no position took a hit to its depth more significantly than wide receiver, where Randal Grimes, Josh Imatorbhebhe, Trevon Sidney, and Velus Jones all entered the transfer portal during this past offseason. With so many bodies missing, the Trojans will likely rely more than ever on their two veteran stars this season, as the young skill players will undoubtedly turn to the leadership of senior wide out Michael Pittman Jr. and junior wide receiver Tyler Vaughns, who are both poised to lead this offense with their collective experience in the program. 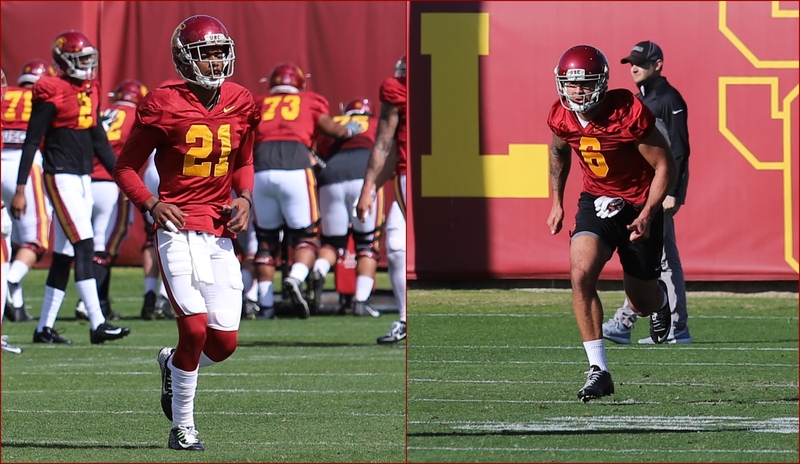 Recruited in a stacked pool of 2016 wideouts, both Pittman and Vaughns have made the most of their time at USC, as commitment to “The Trojan Standard” seems to be a driving force behind the production of these two veteran starters. “[It’s] the hours after practice and the hours between–doing work with the guys and getting extra reps after practice and just getting better each year,” Pittman said. In two seasons, Vaughns has 115 receptions for 1,483 yards and 11 touchdowns, and has been impressive through these first four spring ball practices. “It’s about leadership, and how you hold yourself accountable to your play, whether that be on a practice field or in a game,” Vaughns stated. Among an inconsistent squad last year, Pittman and Vaughns shined despite the adversity that the Trojans faced. Pittman finished the season with 41 receptions for a team-high 758 yards and 6 touchdowns, while averaging an astonishing 18.5 yards per catch. Vaughns followed suit with 58 receptions for 674 yards and 6 touchdowns, including career performances against Notre Dame (12 rec, 120 yards, 1 TD) and Arizona State (TD catch, TD pass, and punt return TD) in 2018. These two lead a talented young receiver group that seems poised to rank in the top 20 nationally this fall. Many of the receivers in coach Keary Colbert’s group have yet to see any action. Walk-ons Matthew Hocum, Jack Webster, and Zach Wilson have seen plenty of reps as part of a depleted rotation this spring, and freshman John Jackson III joins a group with raw talent but little to no experience. Certainly, sophomore Amon-Ra St. Brown did enough as a true freshman that his “youthful” tag is nearly shed, but he is still taking part in his first spring ball at USC. Devon Williams has been a standout so far this spring, but had just four catches last season. As the entire group looks to step up in what could be a wide receiver-dominant offense, there is surely no lack of leadership and support when it comes to both veteran playmakers. How Pittman and Vaughns will be utilized in Harrell’s play-calling is yet to be determined, but one can only imagine the potential that these receivers hold in this new air raid scheme. Pittman’s 6-foot-4 frame allows him to be a significant downfield presence, while Vaughn’s speed, athleticism, and explosiveness allows him to open himself up either in the slot or on the outside. With years of combining playbooks from various coaching staffs, simplification may be key to unlocking the deadly potential of this year’s wide receiver group. How the young talent steps up this year and adjusts to the new offense and the inevitable adversity of the upcoming season will largely determine this group’s success. But one thing is for certain: these young players will not have to look far in terms of finding leadership.